Israel Air Force fighter jets eliminated a terrorist squad in northern Gaza soon after they launched an attack on southern Israel. Israel Air Force fighter jets eliminated a terrorist squad in northern Gaza late Saturday afternoon. Military sources confirmed a direct hit on the terrorist cell, which had apparently just finished launching a mortar attack on southern Israel. Israeli fighter pilots on Friday night attacked two terrorist tunnels, a weapons factory in southern Gaza and a terrorist training center as well. Direct hits were confirmed on all targets, and all IDF personnel returned safely to their bases. “The IDF will not tolerate any attempts to harm Israeli civilians and IDF soldiers and will respond with determination to any attempt to use terror against the State of Israel,” said the IDF Spokesman in a statement. The Hamas rulers of Gaza took responsibility for a lethal barrage of Grad Katyusha missiles on the southern cities of Ofakim and Be'er Sheva Saturday night. One man died in the attacks, and numerous others were wounded, including a four-month-old baby and an eight-year-old girl. 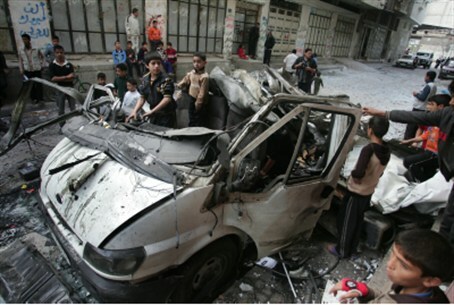 The terrorist organization had earlier in the day announced an end to its oft-broken unofficial “ceasefire” with Israel.